A scene of the accident where 52 cows were crushed to death in a Kaduna village on Sunday, September 9, 2018. 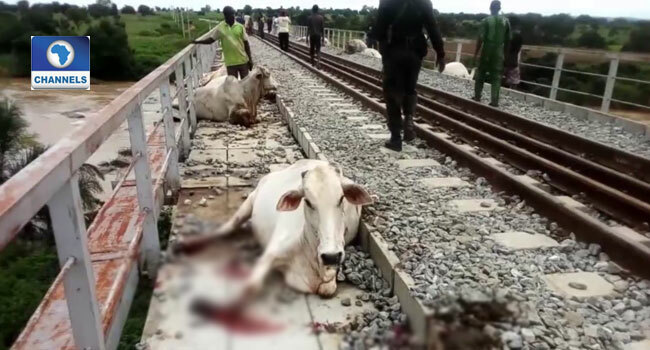 52 cows were crushed to death on Sunday by a Kaduna-Abuja bound train. The Kaduna State Police Commissioner, Ahmad Abdulrahman, confirmed this on Monday at a news conference. 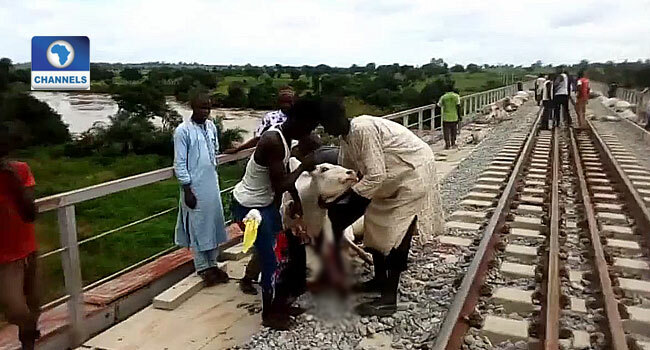 According to him, the herdsmen were crossing their cows through the rail track when a fast-moving train from Rigasa station going to Abuja approached, and in the process of applying emergency break, crushed the cows to death. He also dismissed insinuations that the accident was an insurgent attack. “When we got to the scene, we found out that contrary to earlier calls of insurgent attacks, what actually happened was an accident involving cows. “Herdsmen, who passed the night at Kasarami asked if they could cross over with their cattle and were misinformed that there were no rail services on Sunday. “It was when they were half-way that a fast-moving train from Rigasa Station on the way to Abuja approached. I want to assure the people of Kaduna State that what happened was an accident and no life was lost; only the cattle,” he said.